Michel Sapin is a French politician. In April 2014, he was appointed Minister for Finance and Public Accounts in the cabinet of Prime Minister Manuel Valls. 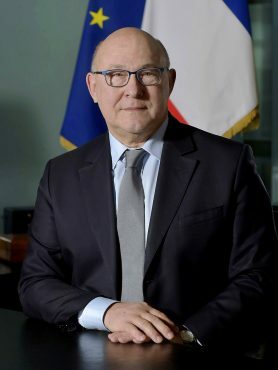 Michel Sapin was born on 9 April 1952 in Boulogne-Billancourt; he is a graduate of France’s National School of Administration. A member of the Socialist Party, he was elected mayor of Argenton-sur-Creuse in the département of Indre, and also served as MP for both the Indre and Hauts-de-Seine départements. His ministerial appointments include Minister Delegate reporting to the Minister for Justice (May 1991–April 1992), Minister for the Economy and Finance (April 1992–March 1992), Minister for the Civil Service and State Reform (March 2000–May 2002) and Minister for Labour, Employment, Vocational Training and Industrial Relations (May 2012–April 2014). He also served as Chairman of the Regional Council of the Centre region (1998–2000 and 2004–2007).